If you own a MacPro, like me, then you know that this is Apple’s most expandable Macintosh computer though there have been rumors as of late as to whether or not Apple will continue to manufacture them. I think not building some kind of expandable Macintosh computer would be a mistake. Apple needs one model of computer that can be customized by the user. The current MacPro model can hold up to four internal hard drives, you can add PCI Cards, and you can even install a second optical drive. The geek in me loves to play with all of these options, if for no other reason, just because you can. Today we are going to look at a variety of “stuff” for our MacPro. The MacPro has four slots for standard 3.5” hard drives, but suppose you want to use a super-fast SSD (Solid State Drive) instead. There is no way to attach these drives to the 3.5” drive sled because SSDs are 2.5” thick. That is unless you have the NewerTech AdaptaDrive. This clever converter bracket allows you to install an SSD or any 2.5” notebook drive in our MacPro. Even if you don’t have a MacPro, this smart bracket will allow you to insert an SSD or any 2.5” notebook drive into any 3.5” SATA drive enclosure. This drive converter bracket allows for speedy throughput with no slow downs. When I attached a 2.5” notebook drive to the bracket it was just as fast as it was when it was in the enclosure it came with. 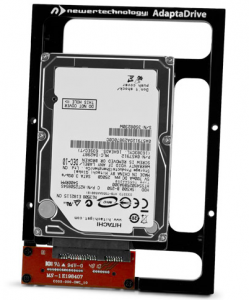 The device is made of tough aluminum and comes with a small bag of screws that allow you to attach any 2.5” SATA drive. Attach to the MacPro internal drive sled, or any external enclosure that supports SATA drives. Installation is easy. A bonus feature is pairing the AdaptaDrive with an SSD and installing that into an older enclosure. SSDs are super quiet since there are no moving parts. This is a great device that helps make old drives useful once again and can possibly make older enclosures compatible with faster SSD devices. 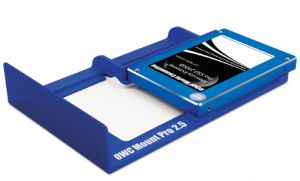 The OWC Mount Pro actually replaces the drive sled used to attach drives to your Mac Pro. Installation is easy, the unit comes with a small bag of mounting screws. The beauty of this sled is the flexibility it gives you to now use 2.5” or SSD drives. The open design dissipates heat better than the original sled by allowing more air flow. The OWC Mount Pro is much more sturdy than the sled Apple provides. It is manufactured from powder-coated aircraft aluminum and feels more heavy duty than Apple’s sled. Once you attach your drive it just slides into the 3.5” slot inside your Pro and aligns perfectly with the SATA connector. The OWC Mount Pro is easy to use and expands the drive options beyond the 3.5” size that you’ve been stuck with in your MacPro. 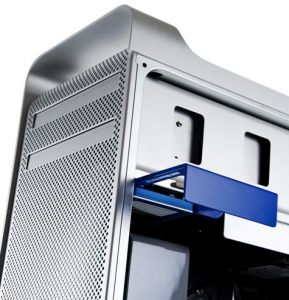 The blue color allows you to visually spot which drive bay holds a 2.5” form factor drive. If you are using the other two items mentioned in this review then you, like me, have several hard drives laying around on your desk. What do you do with the drives that are not mounted in your Pro? Leaving these drives lying around unprotected is not a good idea. They get dusty and static damage can occur if you pick them up while touching the exposed circuits on the bottom of the drive. A better idea is to use the NewerTech StoraDrive. This is a stackable antistatic case made from injection molded ABS plastic. 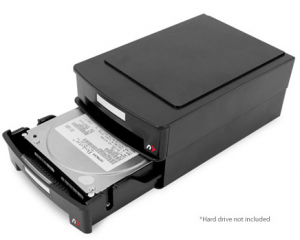 The smooth sliding drawers hold a 3.5” HDD perfectly. Each drawer has a label area on the front that you can write on to identify the contents. The StoraDrive is stackable. An indentation on the bottom of each drawer fits into a groove on the top of the next drawer allowing these to stack. This interlocking feature allows you to stack them as high as you’d like. You get two drawers with each purchase. Note: I did have a drawer slide off a table with a 3.5” drive inside. While the drive suffered no damage a piece of the drawer did break off. Fortunately the area that broke off did not affect the operation of the drawer. In subsequent conversations with the good folks at OWC we discovered that a few of the StoraDrives did not ship with the included no skid feet that you attach to the bottom of the first stacked StoraDrive. This has been corrected. Contact them if you did not get a set in your box. 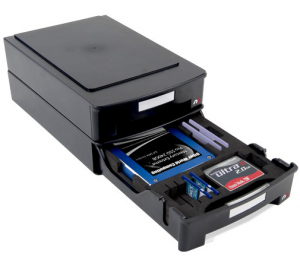 If you have 2.5” drives and/or memory cards you can order the NewerTech Media Storage Tray. This precision cut, static dissipating, foam rubber insert, fits inside a StoraDrive drawer. It has pre-cut slots for any 2.5” SSD or HDD, and also holds up to two compact flash cards, two Sony Memory Sticks, four SD/SDHC/SDXC cards, and four SmartMedia cards. If you don’t own a Mac Pro but still use a NewerTech Voyager or the NewerTech SuperSpeed USB 3.0 Universal Drive Adapter these drawers are a must for your loose drives.